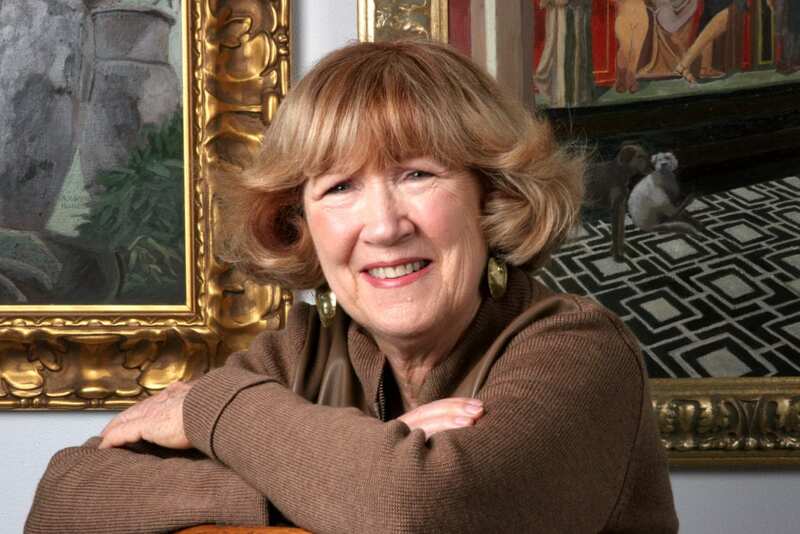 Rosanna Hardin Hall, an Indianapolis, IN, painter and owner of Villa dell’Artista, discovers nature as her studio. Her studios are found throughout the world’s formal gardens where she can linger for days painting fountains, cypress trees, and statues in enclosed medieval and Renaissance gardens in Italy. In Pompeii, Hall captures frescoes, ruins of ancient gardens and classical columns. Discoveries of ancient gardens in the Mediterranean come after long researching tropical landscapes for her master’s thesis at the University of Hawaii. In Oahu, she still ventures into deep tropical forests to capture waterfalls. In 2012, she captured colors of flowers, reflections in long pools, and huge domes in Islamic Mughal water gardens of India. She ventured into English formal country manor gardens with their high hedges, wide green lawns, and black swans. Into plein air painting, Hall adapts the materials and techniques of the Italian Renaissance she has studied at the Florence Academy of Art, Pratt Institute Summer in Venice, and the Maryland Art Institute’s Summer Program at Sorrento, Italy. With all this training and travel around the world, Hall offers some hints borrowed from 19th century French Art Academy techniques in draftsmanship which she studied at the Florence Academy of Art. Hall’s paintings of historic Woodruff Place (Indianapolis) statues and fountains are featured in the Indiana Plein Air Painters (IPAPA) upcoming third book on plein air landscapes to be published early fall 2013. She exhibits widely in Indiana where she has received awards from the Indianapolis Downtown Artists and Art Dealers Association (IDADA). Her work has appeared at the Hoosier Salon’s annual statewide shows, earning a merit award. She also has exhibited at Celebration of Hoosier Women Artists at the Lieutenant Governor’s office, Garfield Park Arts Center, Indiana Artists Club, Columbus Museum of Art, Lafayette Museum of Art, Indianapolis Arts Center, Fort Wayne Museum of Art, Herron School of Art Alumni Show, and at the Morris-Butler House (a collaborative exhibit co-sponsored by Indiana Landmarks and the Hoosier Salon). Hall says of her process, “I am a plein air oil painter who encourages viewers to share the mystery of forms in nature. In my search for outdoor locations, I walk great distances with small canvases and paint supplies. At my destination, I search for dramatic views with patterns of sunlight and shade, shapes, space and drama. “Chiaroscuro makes a landscape: I enhance sunlight and long shadows by viewing the landscape through a black mirror. The mirror helps me adjust nature to oil paint temperatures and values. It tones down glare and allows colors to appear warm and cool, light to dark. The black mirror, also called the Claude Glass, was used by artists early in the 19th century. “I grind my own dry earth pigments such as Carmine red, Veronese green, and yellow ochre into linseed oil. Then I mix them on the palette to simulate the colors I see in the black mirror. ‘After choosing a site to paint, I make thumbnail sketches using bold shapes in charcoal and white chalk on gray charcoal paper. I select the best sketch as a guide when I draw in the composition on a canvas. As I fine-tune the drawing, I use a technique of measurement called size-sighting. By that process, I align my canvas alongside nature so that I draw shapes in the distant landscape onto the canvas in the same proportions. Travel Tales at the Easel, a memoir of my painting adventures, is in process. For a preview of Hall’s paintings, visit www.rosannahall.net.